These guidelines are an important step in the ongoing journey to improve safety for our remote and isolated health professionals. Their impact will only be felt when they are used to improve the policies, procedures, training and behaviours of our industry. Developed following an extensive conversation within our industry, reviewing of available literature and the input of a diverse, national expert advisory group, all made possible with the support and funding from the Commonwealth Department of Health and our Minister at the time, Senator Fiona Nash. 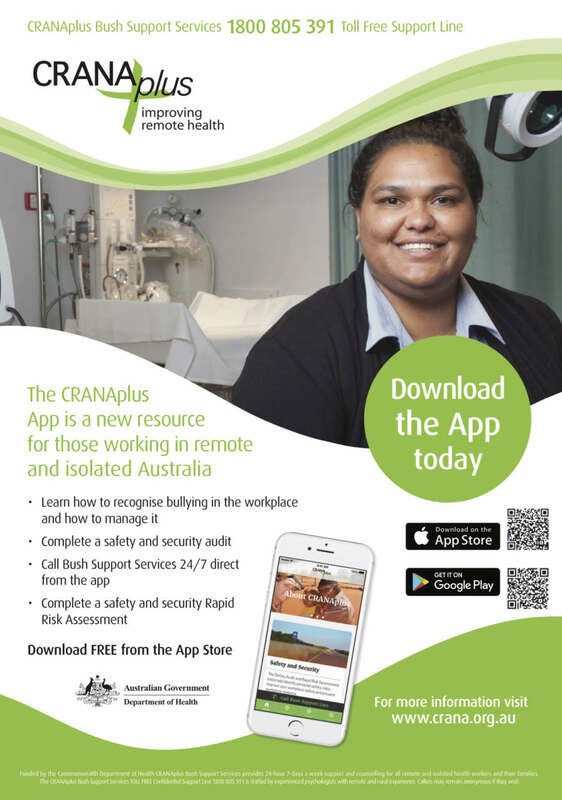 Download the Working Safe in Remote and Isolated Health Handbook here. Download the CRANAplus Safety & Security Flow-Charts here. Download the Rapid Risk Assessment Tool here. Download the Audit Tool here. The Stay Safe and Secure course is designed to enable the remote health staff to develop the knowledge and skills necessary to prevent and manage with confidence incidence that threaten personal safety and security in a remote health setting with a focus on aggression and violence. The delivery is blended with online pre-course learning and a one day face to face workshop. The free Working Safe in Remote Practice online module supports core mandatory training and provides an introduction to remote safety and security issues. It also introduces participants to the use of self risk assessment tools: the Safety Audit; the Safety Flow Charts; and the Rapid Risk Assessment Tool. To register for this free online module, click here. Please feel free to download and use this poster as part of your strategy to ensure community members are aware of expected behaviours. Laminated A4 versions are available free of charge to CRANAplus members. Contact membership@crana.org.au for additional copies. Also available for purchase here for Non Members. A literature review on the safety and security of remote health, building on the 2012 ‘Keeping People Safe’ Literature Review of the Working Safe in Rural and Remote Australia Project. The report is inclusive of the results of a national conversation about the concerns and ideas of the remote health workforce undertaken in 2016. To respond to growing concern about workplace violence in rural and remote Australia, during 2011-2012 the Rural Doctors Association of Australia (RDAA), the Australian College of Rural and Remote Medicine (ACRRM), the Australian Nursing Federation (ANF), the Police Federation of Australia, the Queensland Teachers’ Union and CRANAplus established the Working Safe in Rural and Remote Australia Project.